After launching the party addressing the huge gathering K B Rai attacked Chief Minister Pawan Chamling by calling him a ‘fraud’ and an ‘actor’ who had no idea what real democracy is and one who has deprived the majority community of its rights. “Chamling has just one ambition, to retain in power as CM and continue to be in good book by hook or crooks supressing fundamental rights in democracy” alleged KB Rai in his speech. In his speeach Rai made several attack on Chamling and his govt specially on the Hydel Projects, Rai termed the policy of ruling SDF government as ‘coupon’ politics. Rai alleged that there is no real democracy in Sikkim, ” Old laws which were made during the time of the Namgyal dynasty were discriminatory and unjust, these old laws needs to be thrown away as such everyone’s are justified equally , then only real democracy will come in Sikkim.” Rai added. 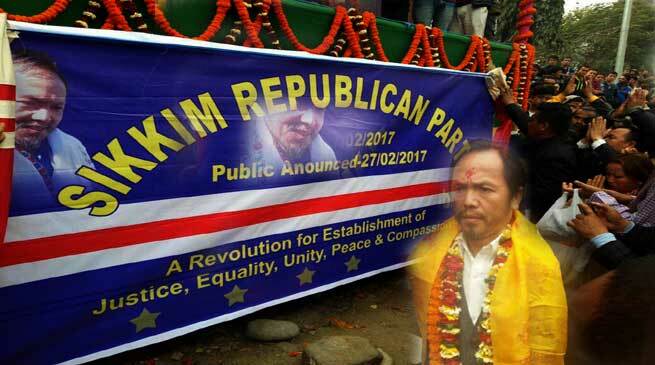 Rai promised to the gathering that “When Sikkim Republic Party comes to power, the first thing we will do is call for an assembly session to dump the old ‘unjust’ laws and we will pass a new law that will ensure that justice is given to all communities,”. “As far as seat reservation goes, we will ensure that it is based on population. It is not fair that BHUTIA , LEPCHA who constitute 18% of the population have 12 seats reserved for them but Limboo-Tamangs who form 15% of the population should get only 5 seats. BHUTIA LEPCHA seats will be reserved constitutionally on the basis of population,” he added.